Hide and Sea is a delightfully spacious 2 bedroom unit, very well furnished and fitted out, situated few minutes walk to the river, Ocean Grove Golf Club, and Boat Launching Ramps. 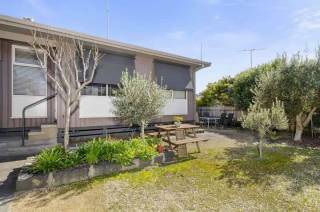 5-10 minute walk to Ocean Grove Main shopping Centre and 10 min walk to main patrolled surf beach at Ocean Grove. Hide and Sea is a short drive to Queenscliff, Pt. Lonsdale, Geelong, Geelong Water Park, Torquay, Portarlington olive groves and wineries, St. Leonards and the Bellarine coastal drive, and one hour drive to Lorne via the Great Ocean Road. Alternatively, you don't really need the car once you are here, you can walk everywhere and relax in our seaside village. Park your car when you arrive and walk everywhere. Hide and Sea has two bedrooms, main with queen bed and 2nd bedroom with trio bunk (double on bottom and single on top. There is also a double sofa bed for the an overnight visitor. There is also a portacot and highchair. There is one bathroom with shower, bath, and one toilet. Hide and Sea has large living, lounge and dining area, with digital tv, dvd, with usb, stereo with ipod doc station. Good heating and air conditioning is included to cater for all year week-end, weekly, short term stays. Kitchen is fully equipped with microwave convection combination oven, stand alone oven and gas stove, dishwasher. The kitchen is well equipped with double sink, plenty of bench space, toaster, kettle, blender and plenty of crockery, cutlery, utensils, pots and pans to cater for holiday stays. 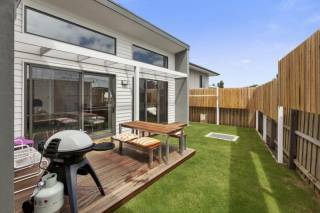 Outdoors there is fantastic roofed outdoor dining area for 6 with bbq and 2 additional outdoor chairs, private and secure front and rear courtyards. Outdoor off street parking. 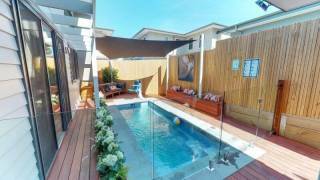 Hide and Sea is a great unit for family holiday stays in a great location, very well furnished and fitted out suiting week-end, weekly, or short term stays. Byo sheets and towels or phone office for linen pack.